From the very beginning that I happened to pick up an issue of American Heritage in the Lincoln Library (a USIS facility full of spooks) in Buenos Aires in 1952 I was drawn to the pictures of long dead American Civil War soldiers in photographs by Timothy O'Sullivan and Mathew Brady. That single issue of American Heritage is why I am a photographer today. As a ten year old I realized I was looking at people who were alive when the picture was taken but somehow they were now all impossibly dead. Through the years I have had a particular fondness for shooting group shots. As the photograph gets older and my memory for the names of the people in the shots fades the photographs seem to be that more interesting. 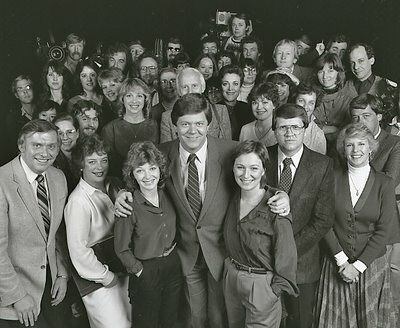 And here is a bunch that I took in the 70s and 80s in Studio 40 of the CBC on Hamilton Street. The b+w one was of the CBC TV News team. I particularly remember Ann Petrie (being held and to the right of Bill Good). 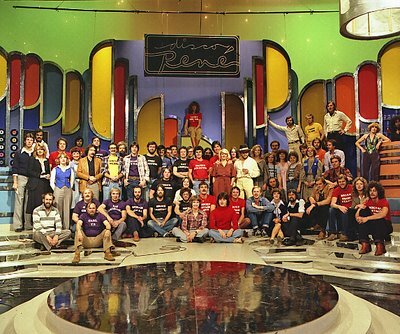 The next group shot I am not sure, but the set is extremely colorful. 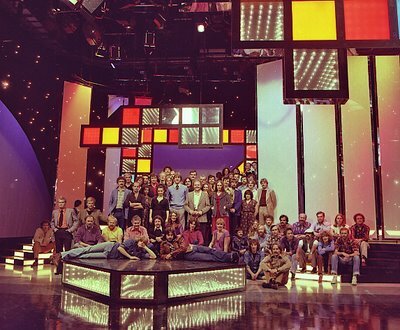 I often wondered why those CBC set designers loved lit steps. Smack in the middle in the light blue sweater is Michael Watt and to his left is choreographer and dancer James Hibbard. The René Simard one is self-evident. I fondly remember Joanie Taylor for her wonderful voice and her Sphinx hair do (extreme right in picture below). Working for these shows was fun because working for the producer (in most cases Ken Gibson and his right hand man Michael Watt) was fun. 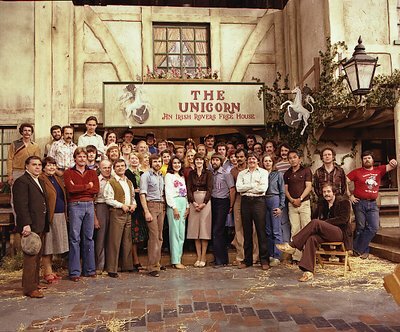 In particular it was fun to work with Gibson's Irish Rovers here in the Unicorn Pub group shot. One of the shows, Boo, was a spoof of horror movies. What I remember best is this group shot of the dancers. The one in the middle was the daughter of the then ex-Vancouver Police Chief, Robert Stewart. We were all in awe of her legs. But it is the last shot that somehow never saw the light of day that is my favourite. In the early 80s brainy comedian David Steinberg had a TV comedy show. In one very special day he invited as many comedians as he could find and asked me to take this group shot. Middle row far right is Ryan Stiles. Two to his left is David Steinberg. I also recognize Jackson Davies, top left.